Bea and Eric met at college at a nine hole. Eric was smitten quite quickly and started calling her his novia (Spanish for girlfriend). He also convinced her to help him with his Spanish class. It took lots of lobbying from Eric's side (and a couple of seasons of Game of Thrones) she started seeing him a new light. Over a long layover in Chicago, they had a romantic date after he asked her to be his girlfriend in O'Hare's terminal 4. Four years later, Eric popped the question on that same spot. And I think that was the only good thing ever to come out of a long layover...! Instead of meeting over coffee, or at an engagement session, I met Beatriz and Eric over their rehearsal dinner the night before at Cocina Abierta. It was a great opportunity to meet them and get acquainted with their families before the wedding in a casual setting. On their wedding day, I met Eric in the lobby of the Hotel, where he was waiting with all of his groomsmen. The day was beautiful so we went out for a while before heading up to Bea's room. On her suite, I started out with all the beautiful details she had set apart for the day. Accessorized in ivory and emerald green, the palette consisted of my favorite wedding colors. Things were getting pretty emotional, so I went through this part with mostly a photojournalistic approach, with a few interruptions for more directed portraits. Weddings at El Convento are very convenient. 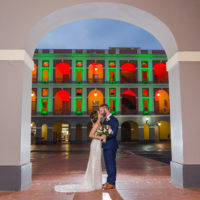 Located in -what in my opinion is- the best block of Old San Juan, Bea and Eric were both getting married steps from the Cathedral, and then they would just need to walk back to the Hotel for the reception. Which frees up time for extra partying. Beatriz and Eric had a beautiful wedding at the 16-century San Juan Bautista Cathedral, located just steps from Hotel El Convento. The ceremony was very emotional and happy, with lots of involvement from relatives and immediate family. After the rituals were finished, we moved quickly to the formal group portraits of the family and wedding party, after which guests walked back to El Convento for Cocktail hour, while Bea, Eric and me did their newlywed portraits around the streets of Old San Juan. After having optimized the timeline around photography, the portraits happened just during sunset, which was spectacular that day, giving us beautiful skies as a backdrop for the photos. After a successful photo shoot, we walked back to El Convento for Reception. The reception protocol was a very emotional and intense part of the day. This is usually where, as a photographer who just met them, I'm able to learn about their relationships with their friends and family members. On the toasts, you could really see how deep runs the love and family values between the newlyweds and their families. After the dinner, the party started and the dancefloor was never empty again. It was an amazing night and I'm so glad I was able to capture such a special day for them. This review is long overdue! Choosing Camille to be the photographer for our wedding was the best decision we made! I first contacted Camille after finding her on social media and absolutely falling in love with her wedding shots in Old San Juan. Every interaction I had with her leading up to the wedding was amazing, she was so professional and on top of every little detail and it truly made a difference since we were planning a destination wedding. We finally met her the day of the rehearsal dinner and it was an absolute treat! Camille was able to capture such beautiful shots of our very big and very rowdy group that night and that was only the beginning. The day of the wedding she made sure we stayed on track and she was able to capture amazing photographs of Eric and I as the sun was setting. These are photographs we will cherish forever!! To summarize, she’s the absolute best! She’s very professional, she’ll make everyone feel absolutely comfortable when taking pictures and she’ll capture in the most beautiful way all the love and happiness that surrounds you that day! Thanks Camille for making our wedding day so special!